C-Flex® EZ Top® Container Closures are used to create a complete container assembly when combined with a cap and container. Economical, designed for single use, EZ Top®s play a key role in the reduction of cleaning and assembly time along with contamination from repeated use. One-piece construction eliminates product loss and contamination due to loose connections. They are made from C-Flex® pharmaceutical grade resin and tubing to insure an unobstructed fluid path, extremely low levels of extractables and provide an elastomeric seal against glass, plastic and metal surfaces. EZ Top®s are easily used with sterile connecting devices and thermal tubing sealers. 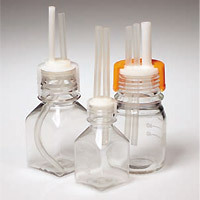 Standard configurations fit a wide variety of glass, plastic and stainless steel containers, from 60mL vials to 20L carboys. Autoclavable. EZ Top® Container Closures are pre-packaged in units of 10. Caps are specifically designed for use with the EZ Top® Closures and sold separately in units of 10. Containers are also sold separately. Custom designs such as port configurations, tubing dimensions, materials, sizes, and packaging available upon request. Ez Top® and C-Flex® are registered trademarks of Saint-Gobain Performance Plastics.